JUDGE ROBERT A. HENDRICKSON was elected to the Twelfth District Court of Appeals on November 4, 2008, replacing the retired Honorable James E. Walsh. 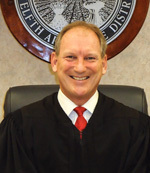 Before beginning his first term on February 9, 2009, Judge Hendrickson served as Butler County Area III Court Judge, West Chester, Ohio from 1997 to 2008. He is past President of the Butler County Municipal and County Court Association and past Administrative Judge of the Butler County Area Courts. He also served as a City Councilman in Monroe, Ohio in 1996; as a Magistrate for the Hamilton Municipal Court in 1996; as an acting prosecutor for both Hamilton and Middletown Municipal Courts; as an acting warrant officer for Hamilton Municipal Court; as a public defender in the Butler County courts from 1985 to 1996; and as an attorney in private practice for over 23 years in Monroe. Judge Hendrickson has been a member of the Ohio Municipal and County Court Judges Association, Ohio Bar Association, Butler County Bar Association, and Warren County Bar Association. Judge Hendrickson was born in Middletown, Ohio on January 8, 1959, and raised in Monroe, Ohio. He was the youngest of four children born to retired 12th District Court of Appeals Judge William R. Hendrickson and Gloria Hendrickson. Judge Hendrickson graduated from Monroe High School in 1977. He continued his education and graduated from the University of Cincinnati with a Bachelor's Degree in Business Administration in 1981 and from the Capital University Law School in 1984. Judge Hendrickson was Vice President of his law school class and President of the Honor Code. Judge Hendrickson is married to Deb and they reside in Monroe, Ohio with their family, Robby, Cassie, Danielle and grandson Ethan. Judge Hendrickson's civic involvement includes Board of Directors member/past President-Sonlight Power, Inc. (a mission organization that installs solar panel systems in third world countries for churches, schools, medical facilities, and orphanages); Treasurer/Board of Director's member-Monroe Area Community Foundation; and a Kentucky Colonel. Judge Hendrickson is past President of the Monroe Lions Club, past President of the Monroe Chamber of Commerce, past President of the Monroe Sports Association (baseball league), past President of the Monroe Youth Basketball League, and past Vice-President of the Butler County Law Library Association.